This Piece is part of Ting Yuen's Seasons Series. "Summer" was painted during the winter months, I was dreaming of a place where I could just lounge and relax to escape my winter blues. 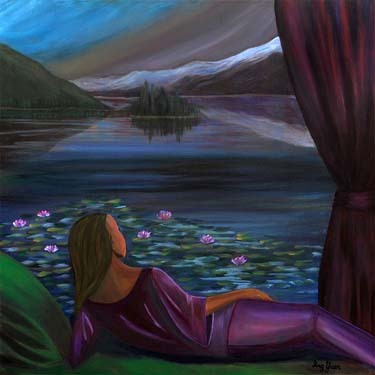 A beautiful scenery with distant mountains, a lake shimmering in hues of sunset colors and water lilies afloat. A place where I could take my mind off my busy lifestyle and bring some kind of magical escape into my daily life hence Summer was created.